But why does a cream that soothes babies’ bottoms also keep our face spot free? The Daily Express answered this question quite well, they wrote, ‘The zinc oxide it contains prevents moisture loss and its lanolin has excellent moisturising qualities’. Sudocrem have obviously cottoned on to the fact that the celebs are using their cream and have brought out ‘Sudocrem Skin Care Cream’ as well as the original, ‘Sudocrem Antiseptic Healing Cream’. However, I maintain using the ‘Antiseptic’ variety, simply because it is more widely available, although the packaging of the ‘Skin Care Cream’ is obviously less unusual in a single ladies handbag, of course. Sudocrem Skin Care Cream is a clinically proven formulation retaining the familiar soothing qualities present in the original Sudocrem Antiseptic Healing Cream. It is gentle and protects delicate skin, forming a barrier against irritants and blocking nasty pollutants. 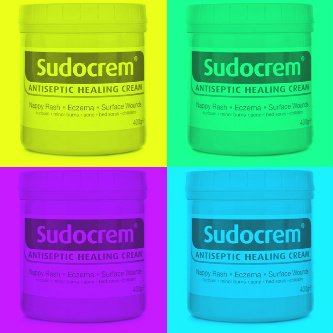 Sudocrem Skin Care Cream is a versatile cream that is gentle and soothing and can be used as often as you need. It is ideal for problem-skin including spot prone, flaky or irritated areas and is great on dry patches such as elbows and knees. Sudocrem Skin Care Cream can even be used after your skin’s exposure to the sun.The handy Sudocrem Skin Care Cream 30g tube makes it perfect for your handbag and when travelling (the size is hand luggage compliant). 10 lipsticks out of 10.